I’m not much of a planner these days but last weekend has been marked in my diary for months – a much-needed catch up with my old college room-mate, co-conspirator and long-term friend. Of course, we see each other when we can but between her adorable children (note to the eldest: you should be a blogger, you talk more than I do!) and my flighty nature, getting a full 24-hours together free of laptops (me) and nappies (her children, not her) is near impossible. So, we did some advance planning and the date was set – Saturday just gone. I do love a good cup of tea. Add some scones, tiny sandwiches and delicate cakes and I’m a happy girl. Yet, despite being British and living and working in London for years, I never quite got around to indulging in the wonderful tradition that is Afternoon Tea, at least not one of the teas offered at London’s swanky hotels. 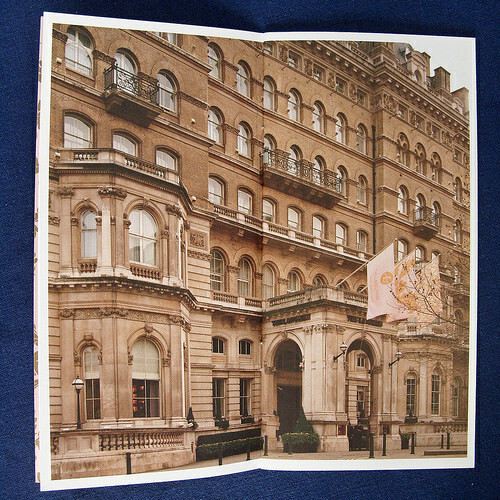 After doing some research, I settled on the Langham Hotel London because it had received awards from the Tea Guild several years in a row (quite the accolade in the afternoon tea world). It also claims to be the place where the afternoon tea tradition started 140 years ago (presumably the tea leaves have been changed more than once since then). I briefly considered the (arguably more famous) tea at The Ritz, but the Langham tea won me over with it’s Bijoux offering (see below) and lack of dress code – while I can and did scrub up nice, traveller flip-flops left at home and make-up applied, I have a post-lawyer aversion to being told what to wear, particularly when I’m paying for the pleasure! 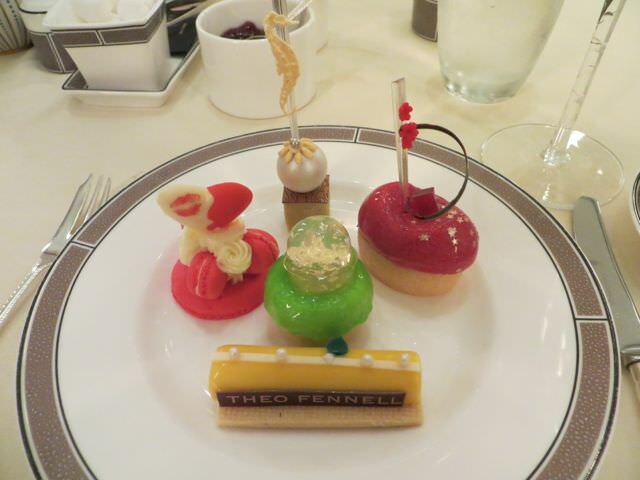 I chose the Theo Fennell Bijoux Afternoon Tea, which is £49 per person. However, because it was a special occasion and because I can barely resist a glass of bubbles, I went for the Uber Theo Fennell Bijoux Afternoon Tea, which was £122 (total for 2 people) and included a half bottle of Laurent-Perrier. And because I’m a sucker for more than a glass of bubbles and because we were enjoying ourselves so much, we added a second half bottle of Laurent-Perrier to the tea. 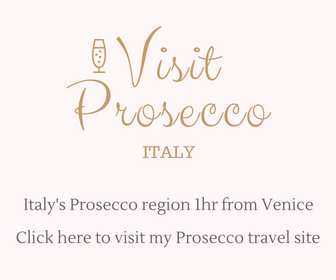 It cost an extra £40, which is hardly well priced, but compared to £32 for two extra glasses (£16 each), it was the more financially efficient option! Together with the service charge, the total bill came to £182.25. Not cheap! 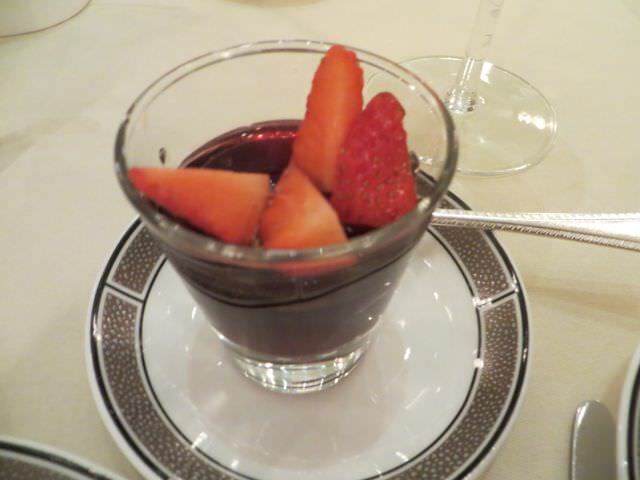 Within minutes of sitting down we were offered an amuse-bouch – a small glass containing raspberry and hibiscus jelly topped with fresh strawberry. Delicate, light, refreshing and definitely enough to tantalise my palette, it was the perfect start to the tea and worked well with the Champagne. We were offered a choice of three teas and under the guidance of the lady (I will call her the teasmaid!). We opted for the Langham Blend (black tea) and a jasmine tea. I’ve drunk enough tea in my time to know that it wasn’t brewed to any strength that was drinkable and being close to translucent, it didn’t look any more appealing. Sigh. Meanwhile, the jasmine tea sat overdeveloping its delicacy so that by the time my friend tried it, the tea was the colour a person might pass if they are suffering severe dehydration. Fortunately (for me, not my friend), by the time I got to try the jasmine a fresh pot was poured and it was delicious. 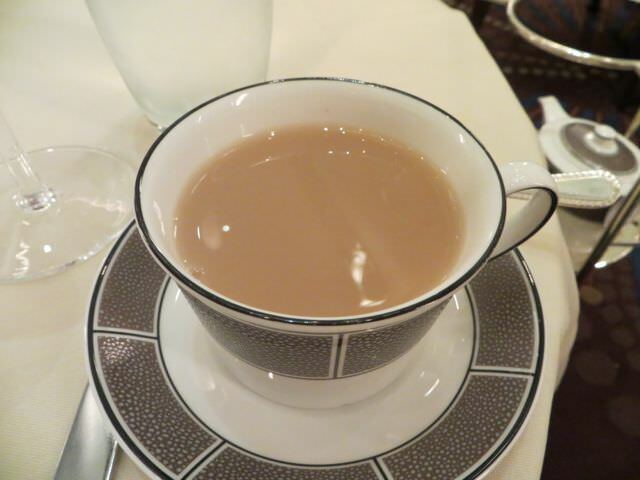 Perhaps the teasmaid was new or perhaps I flummoxed her by going off patter, but the tea part of the afternoon tea left me wondering whether the Tea Guild has ever attended the Langham Hotel London. Still, it didn’t matter, because we had the Champagne to make up for it, which was perfectly drinkable! One of the reasons I opted for the Bijox tea was that the finger sandwiches were not finger sandwiches – they were small canapés. When the plate arrived (one plate to share), I did wonder whether the small bites would be enough to fill us but between the richness and the strong flavours, the canapés were the perfect quantity and we licked up the last crumbs, very satisfied. I can’t decide whether the foie gras or crayfish was my favourite but either way I’d quite happily pack this plate of goodies into my travel bag if they would keep! ‘Scuse my ignorance, but I didn’t know that Theo Fennell was a fine jeweller until I attended the tea and if his shiny jewellery objects are anywhere near as pretty as the cakes we ate, I imagine he is very successful. When the cakes arrived (one plate each) I was presented with the rare but fleeting conundrum of the items being too beautiful to devour, but that one-off hesitation passed quickly. The teasmaid struck once again, recommending that we order the scones next, and, if we were too full, we could take the cakes home. It was a suggestion we both declined. I wanted to eat the cakes in situ, not after they had been carted across London in the rain. And eat them we did. Although they were pretty and delicious, they were overly sugary and I had to pass on the last one through fear I’d trigger type-2 diabetes….or at the very least that I’d need to spent the afternoon running off the sugar-high in Hyde Park. The salted caramel was the clear winner but neither of us ate the plum sponge – it looked least inspiring though still very pretty. I did have a small question in my mind about the level of unnatural food colouring used in the cakes, but not enough to stop me digging in! After a small rest, and getting somewhat tired of saying ‘not yet’ to the dozen requests to bring out the scones, I finally relented and the teasmaid brought them to the table – plain, golden raisin and chocolate orange. I took the raisin, my friend the plain and we both declined the chocolate orange (these are ingredients that have no place in a scone in my opinion). Slathered with enough clotted cream to add clogged arteries to my impending type-2 diabetes, I tucked in. 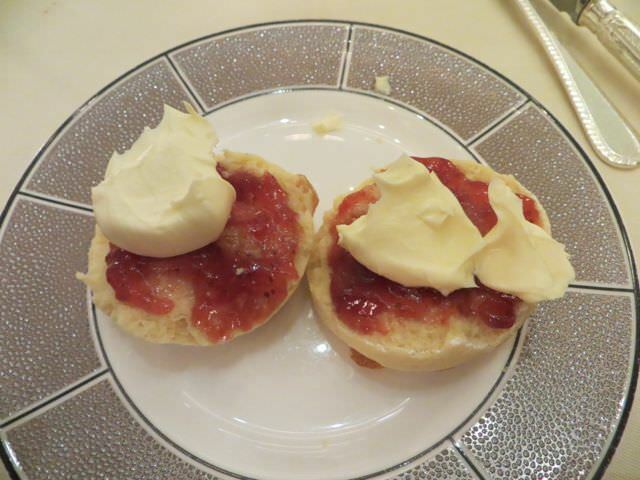 They were nice – far better than average….but not as good as my mum’s home made equivalent (Greek yoghurt with honey is a secret ingredient), but that is not the Langham’s fault – she is a tough scone act to follow. 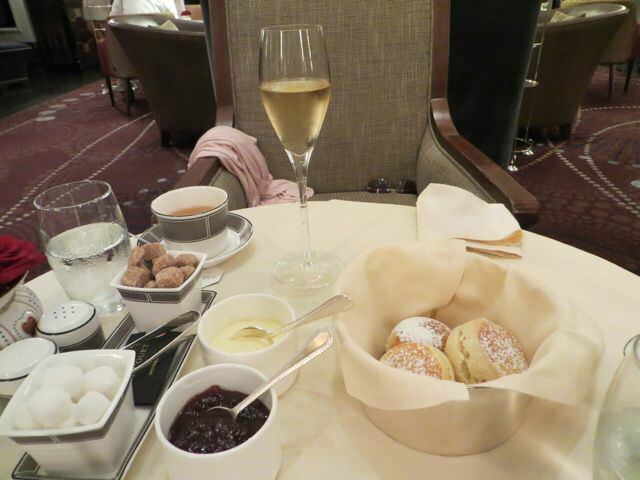 The Afternoon Tea at the Langham hotel was a wonderful, if expensive, treat. The tea itself left a lot to be desired – I can get a better cup with a PG Tips bag (I can do even better with Fortum & Mason loose leaf), but I attribute that to the teasmaid who, I can only assume, is a coffee drinker. The non-finger sandwiches I could eat on a daily basis while the cakes could kill with the sugar they contained…but gained points for prettiness and were fine for a one-off treat (just don’t tell your doctor…or dentist). Leaving aside any comparison with my mum’s baking, the scones were light and delicious (though for a 140 year old tea institution I was surprised they mucked with the formula by introducing chocolate and orange). 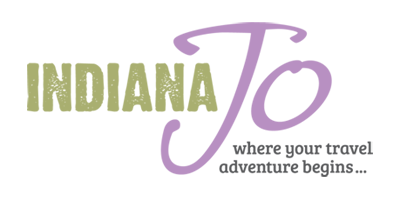 It’s hard to criticise the service when the staff were polite and friendly but I felt more like a back-seat observer in the execution of a highly tuned tea performance than a customer capable of choice. Being asked ad nauseum if we were ready for scones bordered on painful and the assumption about our first choice of tea irked me (mainly because it meant neither was served well). However, I floated out full and on a sugar and Champagne bubble high. The tea was the perfect start to the day. 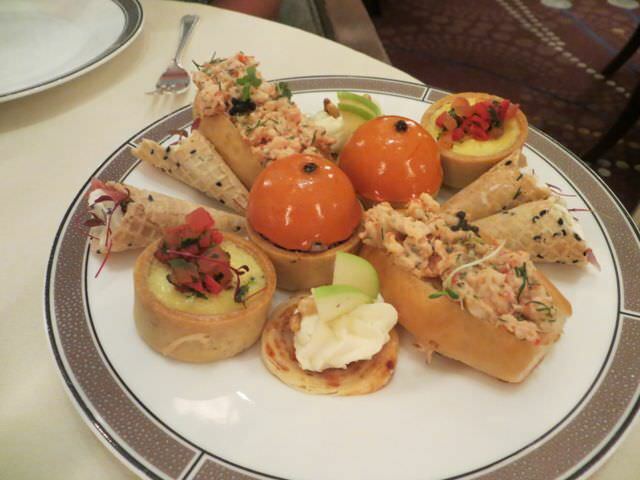 Tara, there’s something quite decadent about an afternoon tea, I think, and the Langham executes it really well. Add bubbled and the scene is complete. I think I might need to make this a more regular treat (tea coffers permitting)!